Let Redcrest Resort be your "Cabin" base while you spend your days exploring the spectacular redwood coast. You'll find many adventures within a 2 1/2 hour drive from Redcrest Resort. Hoby's Market in Scotia, 10 minutes north on Hwy 101. Exit 679. C & C Market in Rio Del, 12 minutes north on Hwy 101. Exit 681. Both markets have a complete selection of grocery items, produce, fresh cut meats, deli and liquor. Also in Fortuna 20 minutes north oon Hwy 101 are Safeway and Ray's markets. We suggest your first stop should be a visit to the Humboldt Redwoods State Park Visitor Center in Weott, 6 miles south. The friendly staff will be happy to answer all your questions. Then it's time to go! Hiking, biking are literally at your doorstep and golfing is just a short drive away. Fishing, swimming, kayaking and rafting are possible on one of our six spectacular rivers. Search for shells and agates on one of the many redwood coast beaches. Visit the Victorian Village of Ferndale which is listed on the Historic Register. See the many turn of the century homes and shops. Many movies have been filmed there, the most recent being The Majestic, with Jim Carrey. Don't miss the cemetery, it's awesome. In the "Good Ole Summer Time", Fortuna, Eureka and Arcata have an old-fashioned farmers market once a week, featuring all home made crafts and home-grown produce. 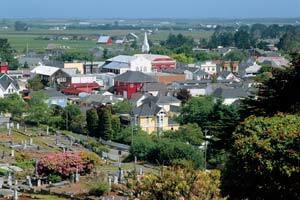 Stroll the boardwalk and visit the quaint shops in Old Town Eureka. A must for you is a meal at the Samoa Cookhouse. This is the last surviving cookhouse in the west. Make sure you're hungry! When you're finished eating be sure to visit the historic logging museum inside the cookhouse. Visit picturesque Trinidad, a fishing town with a scenic harbor. Hike on Trinidad Head and stroll along the beautiful beach and view the historic lighthouse. If pulling the handle of a slot machine makes your day be sure to visit the Casino in Trinidad. Visit spectacular Fern Canyon and Gold Bluffs Beach. Jurassic Park, The Lost World was filmed in the canyon, you don't want to miss it. Watch out for the elk in the meadows at the Fern Canyon turn off and on Gold Bluffs Beach. Trees of Mystery, the trees you've seen in Ripley's Believe It or Not, and the End of the Trail Museum are both in Klammath, California. You can also ride a Jet Boat on the Klammath River while you're there. You don't want to miss the Rockefeller Forest. Turn off of the Avenue of the Giants onto Mattole Road and drive through the largest virgin forest in the world, just 4 miles south of Redcrest Resort, where you will find the tallest trees in the world. Continuing on this road past Rockefeller Forest, the Lost Coast Loop will take you through Petrolia, where oil was first discovered in California. While driving the Lost Coast you will pass through the furthest western point of the 48 states. The Lost Coast Loop takes about 3 hours (you should start with a full tank of gas) and you will see the scenic back country, and end up in the Victorian Village of Ferndale. Ever see a black sand beach? Take a drive to the scenic fishing village of Shelter Cove. Watch the fishermen clean their day's catch. Watch the sea lions on the rocks or maybe you will spot a whale in the distance. Like to golf? There are many nice golf courses around. Benbow to south, Fortuna, Eureka, and Arcata to the north. If you're a quilter, there are many nice quilt shops to be found. Just ask Jeanne. This is just a sampling of the adventures waiting for you on the magnificent redwood coast. Do one, do a few, or do nothing at all. Kick back, relax and ponder what these old trees have seen. Enjoy the beauty that surrounds Redcrest Resort. Our family is looking forward to your visit.